Similar to many longtime Flagstaff residents, Ray Henry came to Flagstaff to attend Northern Arizona University and decided to stay. That was 50 years ago, in 1968, and he has never regretted the decision. Shortly after finishing his studies, Henry earned his real estate sales license, following up with his real estate broker’s license a decade later. As a long-time resident with decades of experience in the real estate industry, Henry has a wealth of knowledge about the greater Flagstaff market. In 1983, he took his passion for real estate even further, becoming a certified residential appraiser and opening two businesses, The Arizona Institute of Real Estate and AREA Real Estate Appraisers. The Arizona Institute of Real Estate provided pre-licensing education for those pursuing their real estate license, broker’s license and continuing education. AREA Real Estate Appraisers provides appraisals of real estate, homes and structures. The appraisals are primarily used to secure loans, mortgages, refinancing and insurance. His appraisals are also valuable in estimating market value for possible sale, estate purposes, divorce settlements and employee relocation packages. 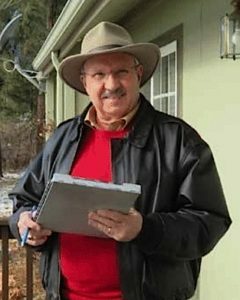 Henry was also a popular instructor at Coconino Community College for 15 years, teaching young and older adults the business of real estate sales. He is recognized by the nationally acclaimed Appraisal Institute’s prestigious SRA designation for his expertise, ongoing education, commitment and dedication to the field, and integrity as a realtor, broker, instructor and appraiser. Today, Henry’s focus is on performing value appraisals throughout Northern Arizona for banks, lending agencies, title companies and other institutions. Although he no longer teaches at his real estate school or at the college, he still finds time to teach and mentor others. He and his wife, Beverly, serve as the assistant pastors at Flagstaff’s Victorious Life Christian Center, where, among other things, they oversee the marriage ministry and drama/arts ministry. The couple has six children, 10 grandchildren and one great-grandchild. For more information about AREA Real Estate Appraisers, email appraisals@azinst.com or call 928-526-6091. What is the character quality you most appreciate in business associates?